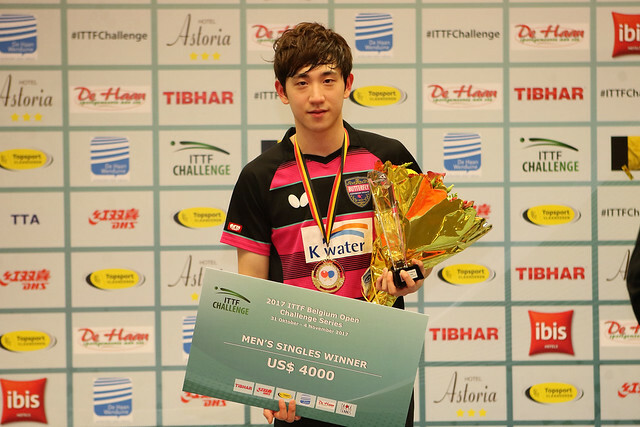 Required to compete in the qualification tournament, Russia’s Sadi Ismailov and Denis Ivonin emerged as the surprise pairing the reach the semi-final stage of the Men’s Doubles event at the 2017 ITTF Challenge Belgium Open in De Haan on Friday 3rd November. Furthermore, they are progressed in an ever more confident manner. In their opening round in the Men’s Doubles qualification tournament they needed the full five games to beat the French pairing of Lilian Bardet and Damien Llorca (13-11, 5-11, 11-9, 12-14, 11-5); since that hard fought win not one individual game has been surrendered. Two further preliminary round matches were won in straight games before in the opening round of the main draw they accounted for India’s Sarthak Gandhi and Sanil Shetty, the no.7 seeds (11-7, 14-12, 11-5) prior to recording a quarter-final success in opposition to Japan’s Masaki Takami and Yuta Tanaka (11-6, 11-9, 11-4), very much a partnership in form. Likewise qualifiers, in the first round they had upset the order of merit by beating Hungary’s Nandor Ecseki and Adam Szudi, the no.3 seeds (11-8, 7-11, 12-10, 11-8). Defeat for Nandor Ecseki and Adam Szudi but not for the other leading pairs, penultimate round places were secured. Top seeds, the host nation’s Robin Devos and Cédric Nuytinck accounted for Spain’s Carlos Franco and Miguel Vilchez in the prior to overcoming Hong Kong’s Lam Siu Hang and Ng Pak Nam (11-5, 11-5, 11-9). Equally impressive and balancing the scales for India, Sharath Kamal Achanta and Sathiyan Gnanasekaran, the no.4 seed duly reserved their place amongst the last four pairs in style. They accounted for Belgium’s Thibaut Darcis and Lauric Jean (11-7, 11-7, 11-6), before recording a quarter-final success in opposition to Sweden Harald Andersson and Simon Ardvisson (11-8, 11-8, 11-6). Similar to Masaki Takami and Yuta Tanaka, the Swedes had caused an opening round upset; they had ousted Chinese Taipei’s Liao Cheng-Ting and Sun Chia-Hung, the no.6 seeds (11-7, 12-10, 11-7). Relatively comfortable progress for three of the four Men’s Doubles semi-finalists; for Germany’s Patrick Franziska and Ricardo Walther, the semi-final place was somewhat harder earned. After beating Turkey’s Ibrahim Gündüz and Abdullah Yingeler in the opening round in three straight games (11-5, 11-5, 12-10); they needed the full five games to end the hopes of the host nation’s Martin Allegro and Thibaut Darcis, the no.8 seeds (12-10, 7-11, 6-11, 11-9, 11-6). Patrick Franziska and Ricardo Walther now meet Sharath Kamal Achanta and Sathiyan Gnanasekaran in the semi-finals; Robin Devos and Cédric Nuytinck oppose Sadi Ismailov and Denis Ivonin.